Disney Donna Kay: Flash Giveaway!! Some of your favorite decals from Magical Creations and Celebrations are now available in an iron on version!! These decals can be put on canvas bags, t-shirts, tank tops, onesies, sweatshirts - you get the idea. 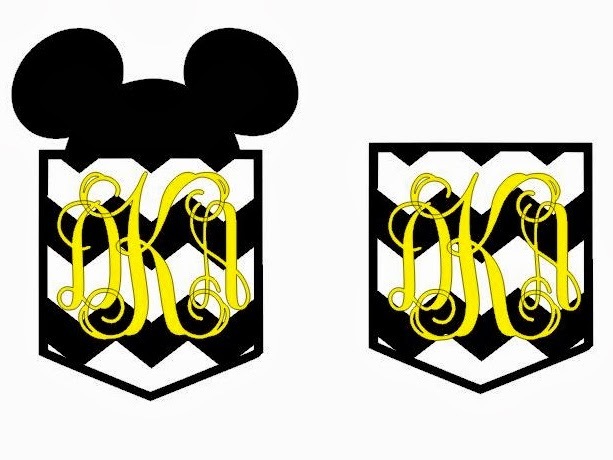 To celebrate I am conducting a Flash Giveaway for one of these adorable iron on faux chevron pockets featuring your monogram (available with or without Mickey Ears)!! Hurry over to enter today because the giveaway ends at midnight on Saturday!! Be sure to get extra entries by letting your friends know via Twitter!! Good Luck! !